A Few Small Projects: Bug screens, whisker pole mod, windlass rebuild, and a new sculling oar lock. We never had problems with bugs in the West Indies as we always anchored out and there was always a breeze. Nonetheless, I wanted to have a full set of screens for the Far Reach. 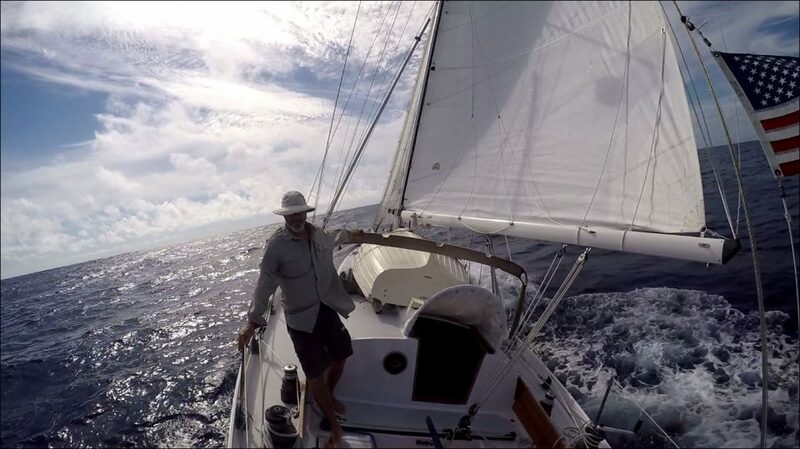 With Hurricane Florence behind us, it was time to return to the preparation of the Far Reach for the voyage back to the BVI and the West Indies. At the moment we are working on a few small but important projects. Described below are a few of them. We completed building the drop-in companionway bug screens. I built the teak frames last winter but got side tracked before installing the screens. I still need to sew up some screens for the foredeck and saloon deck hatches. Gayle sewed a nice padded pouch to protect them when stored under a bunk. All of the standing rigging on the Far Reach is spliced to include the 3/8” bob-stay and the 5/16” sprit-shroud stays. Readers of our rebuild website may remember I hand-spliced the standing rigging for the new mast we built for the Far Reach. It was one of the many projects associated with the six year rebuild. I used a splice called the Liverpool Splice. I learned it by reading Brion Toss’ book The Rigger’s Apprentice. Upgrading Primary Winches—Phase II. And a new winch base design. Before: The primary winches were on a 2” riser pad and were, by design, very tall winches. They also suffered from aluminum/bronze corrosion—IMO a fundamentally bad design. After: The new primaries are a little shorter in height plus I removed the riser pad. They are the same model as the smaller stays’l winches we installed last fall. Note the new winch base with bronze plate. After completing a number of small projects this year, it was time to tackle the last big project for the foreseeable future—installing the new primary winches. The new winches are bronze Lewmar Ocean Series ST 46 two speed winches. The 46s replace the original 1982 era bronze two speed Lewmar 44s. Though they performed satisfactorily, the 44s were a flawed design from the beginning, mixing aluminum with bronze. The aluminum jaws were ate up with galvanic corrosion. For more information on the original installation click here. The removable dinghy step is about 24” long x 9” wide. The sub frame is iroko and the treads are teak. We have found getting from the dinghy up to the Far Reach is not always so easy. It’s a little over 40” from the waterline to the top of the bulwarks. It’s not just us. I think many cruisers find climbing from the dinghy to the mothership a challenge, especially as we get older. And, the traditional stern on the Far Reach means the best way to embark or debark is along-side vice over the stern. Many modern sailboat designs include the now ubiquitous “sugar-scoop” transom, which greatly simplifies the task of getting from the dinghy to the sailboat. The disadvantage of a sugar-transom is that it makes the boat less secure. It’s easy for an unwanted visitor to get aboard the boat by clandestinely swimming up to the stern and crawling up and over the sugar-scoop. And sugar scoops, generally, detract from the aesthetics of the boat. But I digress. Let There Be Light–Adding LED Lights. The Alpenglow LED lights are a nice addition to the Far Reach . Crank Up the Heat: An Efficient Heater Extends Your Sailing Season. Not only is an efficient heater a wonderful luxury, it greatly extends the sailing season. It was about 40° F when I got to the boat the other day. Had a few small projects to accomplish and I needed to complete some reading for a college seminar I teach one night per week. When we rebuilt the Far Reach we installed a small Danish designed gravity drip heater called a Refleks M66MK. It is normally set up for diesel fuel but since we don’t have an inboard engine we jetted it for slightly more efficient kerosene. The combusted fuel is vented out of the boat via the flue and a Refleks smoke-head. The fan on the heater top is called an Eco Fan. It runs through a process called the pelitier effect which is the result of the second law of thermodynamics—heat flows from an object at a higher tempature to a body at a cooler temperature. The fan sits on the cast iron heater top-plate. The fan base absorbs heat which in turn moves towards the cooling fans. In the process, the heat passes over a thermocouple. As as a result, a small amount of electricity powers a 12 volt fan located in the fan body, which drives the fan blade. The fan does a wounderful job of moving the warm air around the boat. It can also be repositioned to blow the heat in any direction desired. When I arrived at the boat it was 42° F.
In no time the boat was toasty warm. The Refleks Heater Has settings from 1-8. We had it on level 1 or 2 … so it’s very efficient. It took maybe 40 minutes to get the temp up to 72° F.
The boat is wonderfully comfortable and quiet. Like a well made tiny house but ready to go to sea and serve as our magic carpet to any place we may desire. I originally installed the small, but adequate, Lewmar #10, non self tailing, winches as stays’l sheet winches because I had them on hand and it helped keep us on budget. You can see one here just forward of the #44 primary winch. When I rebuilt the Far Reach, paramount to the effort was staying on budget. It was not easy. I had to determine a way to make hard choices. One thing I decided was to make use of what I already had if it was reasonably serviceable and relatively easy to replace or upgrade later. Winches fell into that category. The original two speed ST Lewmar 44s were in bad shape. Though powerful, they were a poor design that mixed bronze and aluminum–there was some ugly galvanic corrosion. But they were ridiculously expensive to replace. I could not work around the cost as I was also building a new rig. So I rebuilt them best as I could and pressed on. When I rebuilt the boat I also redesigned the stays’l layout and eliminated the club-footed boom. I installed bronze sheet fairleads on the side deck and installed small (using what I had on hand) #10 single speed non-self-tailing sheet winches on each coaming forward of the #44 primary winches. The design really proved itself on the trip to and from the West Indies but the small winches were barely adequate. This past year, I set aside some money every month and during the summer I purchased four new bronze Lewmar Ocean Series self-tailing winches that were on sale. I bought two bronze #46 two speed ST winches to replace the old 44s. And, I bought two bronze #16s to replace the #10 stays’l winches. The #46s have a different bolt pattern than the #44s. I’ll need to build new teak bases for them this winter. But the 16s have the same pattern as the 10s, so installing them is a simpler job. I decided now was a good time to install them. The first order of business required minor disassembly of the overhead and some cabinetry to get to the nuts on the underside of the deck. This was possible because I designed the new interior to be removable. It took about 30-40 minutes. Getting to the nuts was easy. Removing the 9″ long bolts was more difficult. The second order of business was to remove the nearly nine inch long, 1/4″, silicon bronze bolts that secured the winches. This was not a simple matter as I had used plenty of polysulfied bedding compound and butyl tape when I installed them several years ago. But, after a day of trying various techniques I managed to get the bolts out intact and without damage. Third, I cleaned the bolts at home in the shop and polished them up with a buffing wheel so they would more easily slide back down the long holes through the 2″ tall bare teak rider pad, the 4 1/2″ tall base, the 7/8″ thick deck and the 1/4″ G10 backing plate. I used a 12″ long 1/4″ drill bit to clean out the holes. I re-chamfered the holes in the teak riser pads to help drive bedding compound around the bolt shafts below the surface of the winch base when I tightened the nuts. Then I test fit the bases and taped them off. I removed the winches and positioned the bolts through the holes. I wiped the winch base and the teak pad down with acetone to remove residual oil and grease. I used butyl tape to make small donuts around the bolts just under the winch base. I applied the polysulfied and installed the winches one at a time. My daughter Cailin used a large screw driver to hold the fasteners in place while I tightened the nuts below deck with a deep socket wrench. We cleaned up the squeeze out, removed the tape, and reinstalled the drums. They looked great. They are more powerful than the #10s and also they are be self-tailing. The bronze Ocean Series appear to be very nice winches. They require no tools to disassemble for cleaning. These are the model BBB which has bronze covers over the ST jaws vice the polymer covers which can degrade in the sun. I look forward to using them and seeing how they work. Replacing the primaries is Phase II and replacing the jib and main halyard winches is Phase III. The Far Reach has a headstay and a forestay. Until recently, the forestay was dyneema with a spliced bronze eye connected to a bronze turnbuckle. It was difficult to disconnect the forestay and pull it back out of the way to make short tacking easier. Cutter rigged boats like the Far Reach have a headstay and a forestay. The forestay is sometimes referred to as the inner-stay but it is correctly called the forestay as it supports the fore stays’l. A challenge for cutter rigged boats is tacking with both stays rigged. If the slot between the two stays is narrow, and sometimes even if it is not particularly narrow, the jib can get “hung up” on the forestay as it passes through the slot from one tack to the other. When short-tacking (tacking a number of times in rapid succession) up a narrow channel you can get into trouble if your jib fails to pass through the slot between the stays. Occasional tacks should not be a concern and every sailor should be able to tack their cutter reliably with only the occasional hiccup.